South Korean President Lee Myung-bak has told his nation it must unite in the face of military aggression from the North. Mr Lee said in a national radio address that what was at stake was "the survival of this nation". He added: "If [we] are afraid of war, we can never prevent war." The Korean peninsula has been tense since the North shelled the Southern island of Yeonpyeong last month, killing four people. On Sunday, it was announced that South Korean and Chinese defence ministers would meet in Beijing in February for talks on the situation. In his broadcast on Monday, Mr Lee said: "We can't afford to have division of you against me in the face of national security, because what's at stake is our very lives and the survival of this nation." Mr Lee said divisions of opinion after the North's alleged sinking of a Southern warship in March with the loss of 46 sailors had led to the North's attack on Yeonpyeong island. He said: "It is when we show solidarity as one that the North dares not challenge us. Their will to challenge breaks." Mr Lee added: "We have clearly realised the fact that only strong counteractions to military provocations are able to deter war and safeguard peace." 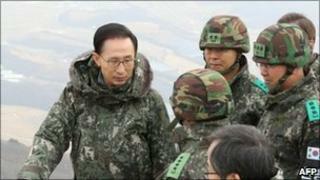 His government came in for some criticism at home as weak after the Yeonpyeong attack. Mr Lee said he had learned "valuable lessons". Since the incident the South has replaced its defence minister and embarked on a series of military exercises while ratcheting up its rhetoric. The North has not retaliated militarily but amid the rising tension last week vowed a "sacred war". Pyongyang denies the South's claim that it sank the warship. It also says its shelling of the island was retaliation for a South Korean firing drill that dropped shells into North Korean territory. In a commentary on Monday in state daily Rodong Sinmun, it warned that joint US-South Korean exercises were "reckless military provocation". "There is limit to our patience," the commentary said. At the end of his speech, Mr Lee said the South still wanted peaceful reunification with the North. On Sunday, defence officials said that South Korea's Defence Minister Kim Kwan-jin and his Chinese counterpart Liang Guanglie were organising talks in Beijing in February, but added that details of the meeting agenda would be discussed later.